Here are some cat face coasters for your tea or coffee cup. These coasters are 4" wide x 4 1/4" high. 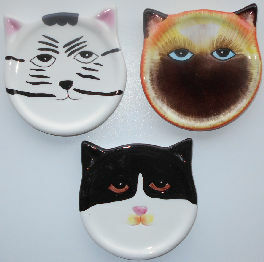 The coaster top left is a white cat (1 available), the coaster top right is a tri-color cat (2 available) and the coaster on the bottom is a black and white cat (sold out). Previously owned but in good condition.